The DoorBird D2101V IP video door intercom allows the home or property owner to receive a push notification on the free iOs or Android DoorBird app when the call button is pressed or when motion is sensed. Tenants and homeowners can answer the door from anywhere in the world just as easily as if they were home. Users can proactively check live video, listen in or choose to have a two way voice chat with the visitor or intruder. The built in high definition colour video camera captures amazing high definition 720p colour video during the day. When it gets dark it automatically switches to night vision mode with night vision provided by the built in infrared LEDs. The built-in 4D motion sensor can be adjusted to only pick up motion in select areas, and it can even differentiate between visitors coming and going! DoorBird features FREE cloud access, live viewing and cloud recording. The free service includes VGA images of the most recent 20 visitors. The optional paid cloud service features HD videos with up to 7 days of unlimited videos. Both free and cloud service allow images/video to be downloaded to the users smart phone or tablet. In addition, DoorBird stations have on board memory to store VGA images of the last 50 vistor history. DoorBird can also be integrated with SIP systems, select ONVIF enabled NVRs, and 3rd party applications including Control4, Crestron, URC, RTI, Chamberlain/Liftmaster, Fibaro, Kevo, Elan, Savant, Genie, Vera, August and more! Web interface, open API and MJPEG feeds can be used to create custom integrations as well. Two relays are on board to allow connection to a door strike, allowing tenants to let visitors in using the app. There is also an RFID reader built in to the door station, to allow tenants with a valid card, to unlock a door. 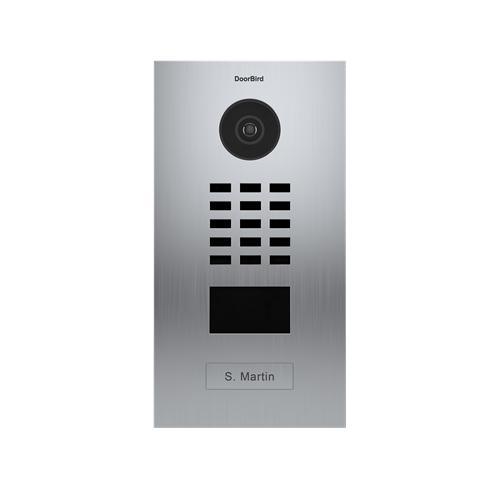 The built in RFID reader can be used with Doorbird access cards to allow tenants/users to automatically unlock a door or open a gate, or trigger an even by simply presenting their credentials to the DoorBird intercom. The DoorBird service is FREE with no set up or monthly fees. Cloud video recording is available for an optional monthly fee. Multiple users can be set up to receive alerts or check video/audio as needed. Users can have access to multiple doorbird stations in a single home or multiple properties using the same app. The Doorbird station comes with a flush mount back box. An optional surface mount back box is available separately. Flush mount standard. Surface mount box available separately.